This is the face of a true rescue. Amethyst was found as a stray by the pound and only weighing around 36 pounds when she should be closer to 50-60 pounds. She is very malnourished and has a long way to go in recovery. 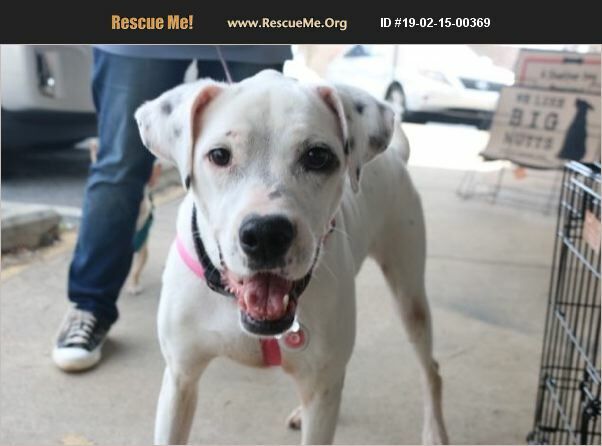 Amethyst is between 2-5 years old, 36 pounds, and a believed Boxer/Dalmatian Mix. She is good with dogs but has not been cat tested. That would be something you would have to do at your own discretion. We will not be homing her with small children due to her past abuse/neglect. Please consider adopting this beautiful girl. She has been pulled from the pound by Ruffus Rescue and will remain in her foster home until she's a healthy weight, around 60 pounds. Please check out her updates on Facebook @ruffusrescueatlanta and to apply for her please go to Ruffusrescue.com. *Update* She is spayed and ready for adoption. She has also received some training to work through negative behaviors. Our trainer would be happy to help any potential adopters.